A secondee’s story in the West Kimberley, 2015. Video by Qantas. Communities supported include Ardyaloon, Beagle Bay, Fitzroy Crossing, and Lombadina. 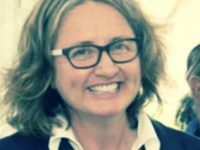 Prior to being appointed Regional Director of West Kimberley, Corinne was Regional Manager of the Central Coast region in NSW. Corinne is a Central Coast local who loves the sandstone, the angophora trees and the living culture of Darkinjung country. She is excited to move to West Kimberly and call this region her new home. Corinne is trained as an artist and an educator, and has spent most of her working life in arts and education, community empowerment and capability building. Through working alongside mainstream educational systems, Corinne developed a respect for flexible and expanded modes of learning. Corinne has worked in the for purpose, public and private sectors and is passionate about skills transfer, creative capital and personal agency. Before joining Jawun, Corinne managed a Visual Arts Outreach program across five remote communities in the Barkly Region of the Northern Territory.